Let's have a look at why cyclist would want to wear a Respro anti-pollution cycle mask. Personally I have been an environmentalist all my life, I always said I would never own a car and always cycle. But you get older and well... find excuses... as much as I enjoy driving, as a cyclist I hate the heavy footed motorist or bus driver. Who either seems to deliberately hit the pedal to gas me, or are so desperate to overtake they need all 120 horses to pull past a man on a bike doing 29mph on a 30 road whilst approaching a red light. Still least we not judge the half baked motorist who cant look ahead. When I look ahead I see the long term risks of breathing in pollution and as an asthmatic, I want to try and protect my lungs as best possible. Being of scientific mind, I was always sceptical of anything that claimed it could filter diesel particulates, these nasty critters enter easily into the blood stream as they are so small and we are told are impossible to filter out. Be thats as it may, there are pleanty of other pollutants to worry about and living in a city and near a high usage HGV and bus routes I wanted cut down on noxious fumes entering my body when my heart and lungs are working hard. I have been using Respro masks for some years, whilst they may cover your face, and some people may not like the feeling, the benfit is quite clear, the smell of fumes diesel and unleaded is greatly reduced and I no longer have to time my breathing for buses pulling out infront. The Respro City Mask is easy to fit. The velcro at the back just fastends around the base of your head and the nose clip can be adjusted to best fit to stop unfiltered air entering the mask. The mask can become damp at times but it is not a real problem and the filter should be changed at least every 6 months. This is very easy to do and takes a few seconds. Spare filters for all Respro masks are available online and in store. The whole thing is also easily washable and allergy free materials are used. So for an asthmatic allergy sufferer like me, this is a real win win. Usage wise you are probably going to benefit most in cities and polluted areas. There is little point in using this in the country side..... Unless you suffer badly from hayfever in which case, this mask combined with a pair of wrap around sunglasses will protect you from pollen and keep your suffering to a minimum in the beautiful summer days. Did I notice a difference? The London nose blow test tests say yes, the asthma suffering test says yes, and the uncontrollable hayfever test is a clear winner. For me it's a five star rating! bit, check out our dedicated Repsro facts and questions page. 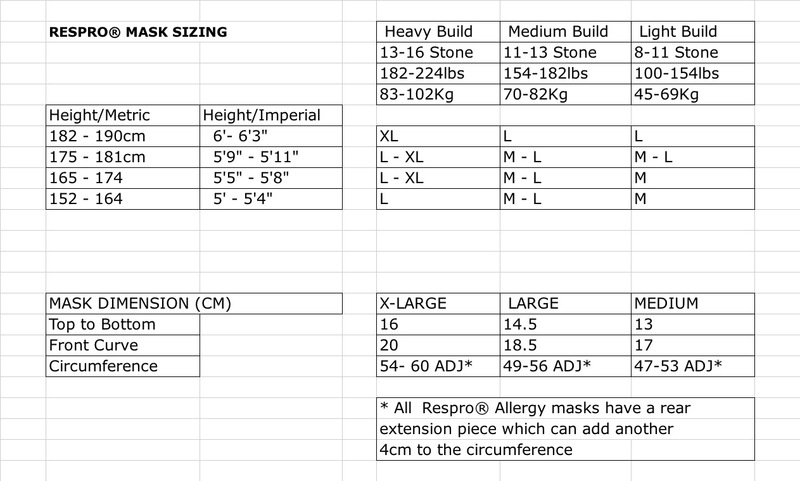 Thanks to the clever people at the Respro labs we can show you a very handy size chart to help you get the best fit! We have been pretty excited about Scott's 2013 range over the last few months. They have received a great response from our customers in Oxted. But the question right now on many people's mind is how much? We all know Scott Bikes are well built high performance riding machines. They are one of the few manufacturers for instance to publish weights, which goes to show how confident they are about their attention to detail and determination to build the lightest bikes for your bang. The Scott Speedster 60 2013 is the ideal entry level road bike it comes in at £499, with Shimano 14-speed drivetrain, Syncros Race 28 wheelset, carbon/alloy fork, 21.13lb (9.9kg). It comes with arero dynamic tubes derived from the top of the range F01 making it 20% more efficent through the air and is a marked improvement on their best selling bike over the last 2 years. However this is actually a complete revamp and they have done a amazing job especially for the price. You simply cannot get a better bike for your money. The bikes road frame features durable and economical parts on a comfortable 6061 double butted alloy frame, and packed with big name components, such as the upper-mid range Shimano drive chain with the well respected HG40 and FCA2350 chain and crankset. If you are new to Road Cycling or want to upgrade on to a modern slick bike but don't want to spend your inheritance just yet this is the bike for you. Scott have brought years of cutting edge research and engineering into the entry level market. The bike is runs with Internal cable routing and aero fork also help reduce drag. Overall it is a comfortable bike that is a great introduction for new comers or even teenager to get into road riding, long training rides or start competing. At Petra Cycles, we sell a lot of small spare parts and they are as you can imagine these are frustrating at times, either to identify or get hold of. Whilst we have a reputation around the world for these parts, they are not particularly profitable and certainly not something we consider a bread winner for us. This leads to a number of problems and we are very open about how we work, let's look at a few issues and tips so you can get what you need and know what to expect. First we will look at the common questions. Why do you charge shipping on small Shimano Spares? We have to pay someone to pack it, card fees, packaging, postage, etc there is not enough money in the spare parts to even ship the order. Sometimes just a few pence, hence why most shops wont sell them. Basically if you can't find it on our site we can't find it either, new product releases mean we have update every few months, so you might be lucky with a new bike spare but not older ones. As a rule of thumb 5 years is the average stock life for spares and 7 years is the absolute max. Will X work with Y? Why does it take a few days to source? We are not a big company so we hold only popular bikes spares in stock. Other parts have to be ordered in and for this we depend on supply. Sometimes they are out of stock too and stock cycles average from 1 month to a maximum of 6 months. Sorry we just can't get them any faster. How do I find the part I need and can I install it myself. Can you help me sort out all the parts I need? This is a hard one for us, we are just a Local Bike Shop, we don't have a lot of resources and to be frank we just can't afford too. The time involved in solving problems is high and we get a lot of requests. We just ask that people use there Bike Technical Help section of the website, where we have resource of info for self help. We have just 3 people at Petra Cycles and they are very stretched and operate in a very tough market. Ultimately it is not cost effective for us to help everyone. But if you get really stuck we will do our best! After all is said and done. if you can't find the spare part or you can only find some bits, or it is all a bit too much to deal with, it is often simpler and easier to upgrade the whole component especially with the more entry level bike components. As the cold weather sets in and bites at the toes you can be sure of one thing, numb wet feet, especially at the toe end, where all those nice little air holes in your SPDs let in a draft of freezing air with each stroke. Helpful in the summer months, but not so good in December - February. In the past we used to see a lot chemical based foot warmers, often used by snow sports types but costly in the long run and sadly no longer available to us as Elite dropped them from their range. However in recent years we have seen a real improvement in the technology behind SPD over shoes and shoe covers. They are easy to use and fit and slip on over your existing bike shoes and have holes for the clips and heal so you can walk around in them as well. Made of neoprene, i.e wetsuit material, they are super stretchy and in this case water proof unlike wetsuits. Being a surfer as well as a cyclist I can tell you that under heavy usage neoprene will last you a year or two before it starts to break up. But under low usage to average, you should be able to get 3-4 years out of these. Especially the models we are going to look at here. It really is as simple as how often you use them and take put them on and off, also don't ever leave them in the Sun during the summer as UV light breaks down neoprene. They come in a variety of options and of course sizes and we carry two main brands BBB and Shimano. They protect from winter conditions and keep your feet dry and warm. Meaning you have one less excuse to get on your bike or off the turbo trainer and go for a proper ride. Most are designed for road riders and come in streamlined shapes with additional reflective decal for added attention during the cold long nights. Features: Designed to protect your feet against cold and wet conditions. Neoskin waterproof layer on top of 3mm neoprene offers the best protection against the cold and rain. Glued seams make them 100% leak proof. Reflective industrial-strength YKK-zipper. Two Kevlar reinforcements between sole and zipper as well as on the nose. Velcro rubber strap for a secure fit. Sizes: 37/38, 39/40, 41/42, 43/44, 45/46 47/48. These are also available in the WaterFlex Shoe Cover version which are more aimed at heavy rain rather than cold weather. Shimano used to market their shoes under their sub brand name Pro and this year sees some serious revisions to the ranges and a rebrand to Shimano Clothing. They come in Endure H20, Tarmac H20, Endure 3mm and Blaze 2mm as well as several other variations. For the sake of argument and comparison lets look at the warmest and driest in our opinion. With an RRP of £41.99 these really are not the cheapest from Shimano but we like to look at the best in the range. 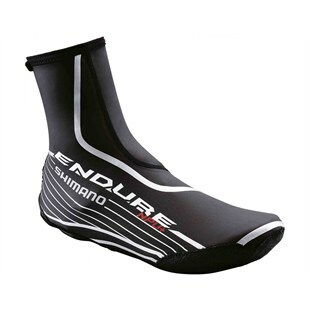 Endure NPU 3mm bicycle thermal overshoes. So there you have the two main comparable products and if it were down to me on price and value for money I would choose the BBB as a breakthrough entry. Their products are reliable and well known in the Netherlands but growing well and fast in the UK. Shimano are running a premium here and will be a little warmer due to the material construction. But all in all both well keep you warm and dry and on the road for longer, just up to you on budget. Feel free to post your comments about either or other below, being a small shop we are unable to test and review everything! There are car parking spaces on adjcent roads and a FREE car park round the back on Elice Road although you must display a free 4hr ticket. Servicing can be booked in advance or over the telephone and you can always drop your bike in anytime without an appoinment but during busy seasons you may have to wait for a few days as we often have a tight work scheudle. We will always offer you a quote before you commit and are prices are very fair compared to big brand name stores and larger shops. We also sell new bikes from Scott Bikes, Felt, Merida and Claud Butler and hold a range of each in store at all times. The staff between them have over 25 years of experience and come from a range of cycle industry backgrounds. Chris who works in our fully kitted out workshop used to race for a team in South Africa and Kobus has worked with and around bikes all his life. So you can be assured of a personal and dedicated level of service from us. We place ourselves in the mid-high end range of bikes purley becuase we feel that you pay for what you get. If you buy a cheap bike from a superstore then you are going to end up spending a lot on maintence over the years. Where as if you buy more expensive bike, you will see more life out of the components, have a higher performance bike, require less money for servicing and most importantly love your ride and want to keep riding! Frustration from buying the wrong bike can lead to a short lived sporting endeavour. In store you you will find large range of bike helmets from Bell and Gyro and dedicated section for kids helmets as well as Bike lights from Blackburn and Smart. We also stock Brooks Saddles, Brooks Handlebar Tape and accessories. For the more modern cyclist we have a wide range of Lezyne Pumps, Toolkits and bags as well as Topeak Track Pumps and Saddle Bags. Pop in and come and checkout our in store range Monday to Saturday 9am to 5.30pm and late opening on Thursdays until 6.30pm. Kobus, Chris, Tom and Peter will be delighted to help and dont' forget we have a very comprehensive website with a huge selection of components and bike parts.